Well isn't that just cute as a boot ;) Love it! This is so cute! 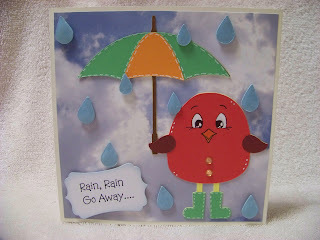 I love the background paper...the raindrops...everything! What a cute image. I love the background paper and raindrops, especially the ones you added on the inside. OMG!!! He is so cute! Good luck to you my friend :0). awww, what a sweet little birdie! 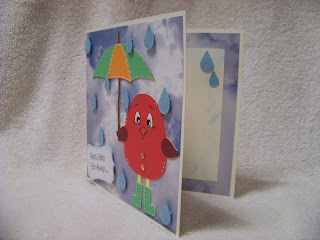 great design here Sharon, beautiful card! What a cute card! I LOVE those little boots on the bird. Adorable!